Isabel tells us that she tries to appear as a very healthy and strong person because it helps her believe that she is! She abhors the whiner who’s all the time in pain, who seems to thrive on being perceived as frail. She’d rather project being “strong as a bull” and tough. Why? Because it energizes her and feeds her passion for life. Start training today to say “Yes to life”. Don’t be a whiner. Limit your complaints about your health and aches and pains to your doctor’s office. Exercise daily. Your strength and vitality will fade and continue to fade if you don’t. Clean out your closet and update your wardrobe. You’ll feel confident and energized. 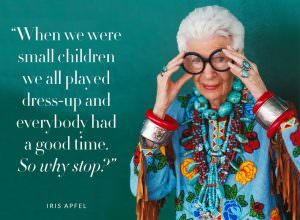 As Iris Apfel says “When the fun goes out of getting dressed, you might as well be dead. Wear something that says ‘Here I am’ today.” And don’t shy away from vibrant shades, hats, jewelry or scarves. Socialize and be interested in others and join in even when you don’t want to be bothered. You never know if you’ll get a good laugh or make a new friend. Be present in your life. Ask for help when you need it! Do not succumb to passivity. Be your own best advocate. Retirement in Spanish is “jubilacion” – jubilation, celebration. We have paid our dues. We have contributed to society. Now, it’s our time, and it’s a great time. Isabel has chosen to stay passionate, engaged with an open heart. She’s working on it every day. Why don’t we join her?